Expand the available storage on your PC or laptop and store copies of important files by investing in an external hard drive. External hard drives can extend the memory of your computer exponentially, with devices like the iStorage diskAshur 2TB offering up to 8 terabytes of additional storage space - that’s like 8000GB to you and us (and to think the average iPhone provides about 16GB). It's no wonder they have become a staple piece in our tech kits. But what is the best external hard drive and what do you need to look out for? We all know you can use an external hard drive to store images, videos, movies and other large files, but, many people actually store copies of all of their files on their external hard drive, as it gives them a complete backup should something happen to their main device. With that the case, many hard drives feature advanced in built security, which is something you should certainly consider when choosing your external hard drive. Some devices, such as our top pick, the Western Digital My Passport 4TB, use encryption to protect your files from sneaks and dangerous spyware. While some external hard drives are portable, like the Western Digital My Passport and are powered via your PC or Laptop, others, like the iStorage diskAshur 2TB, are desktop hard drives, and therefore tend to have their own mains power cable. External hard drives connect to your PC via USB, however the type of USB connection will control how fast you can transfer data from your main PC or laptop to your external drive. USB-C is the latest technology and will therefore offer you the highest transfer speeds, however your PC will need to have a compatible port. If not, no matter, as most external hard drives are compatible with USB 3.0 and USB 2 ports, with USB 3.0 being the significantly faster one out of the two. When it comes to purchasing an external hard drive, Amazon is a great place to head for a good deal, while Currys too, often have a good stock of PC accessories if you prefer a familiar high street name. We’ve rounded up the best external hard drives from various different brands, so you can choose the best one for you. This plug in and go device is fantastic all-rounder that doesn’t cost an arm and a leg. It does everything you need it do, including providing tonnes of additional storage space, protecting your files, speedy transfers using the USB 3.0 port and it’s compact in size- great if you’re looking to stow it away in your laptop bag when not in use. With 8 colours available, plus the choice of a standard or metallic finish, this external hard drive can become as much of a fashion accessory as your laptop. If security is at at the top of your agenda, you probably can’t get much better than this military grade external hard drive which encrypts all data in real time. With the promise that your files will be safe even if the hard drive is removed from its enclosure, you can be pretty confident in its abilities - and let’s be honest, you wouldn’t expect anything else considering the fairly hefty price tag. You can’t access the files on the external hard drive unless you know the pin number, and with the option to set up 4 individual user pins, you can make sure that the device remains accessible, yet safe at the same time. Whether you’re simply clumsy, or you don’t like the idea of someone breaking into the inner depths of your hard drive, the people behind this device have made sure that it’s gone through military level testing to ensure it delivers what it promises. With a highly shock absorbent body, and water and dust resistant exterior, this external hard drive is a toughie. The data inside is safe, too, with full encryption to protect your files from unauthorised access. While it doesn’t have as much storage space as other devices on our list, it certainly makes up for it in security. With essentially the same technology as an SD card, this isn’t one for those looking for the most secure external hard drives, but it’s more the adequate for the everyday PC user looking for a bit of extra space to store stuff. Having also gone through military grade testing, we know it has a strong exterior, but there is no encryption to speak off if your files are extra private. Having said that, it’s much faster at processing than traditional external hard drives, and it’s compatible with USB 3.1 technology, so transfer speeds are quicker, too. It’s worth mentioning that its storage capacity is nowhere near as big as the others on our list, but it’s more than adequate for most. 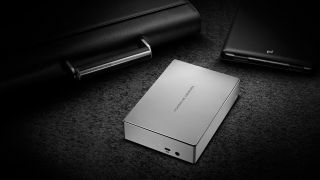 This unlikely pair up with leading car designer Porsche has led to an external hard drive which embodies Porsche’s two main values - flashiness, and speed. With a sleek silver finish and featuring the latest in speedy USB data transfer technology, this is certainly the one for the gadget lovers, despite, deep down, it doing exactly the same as other hard drives on the list - that’s giving you more room to store stuff! With 4TB of storage available, it’s fairly hefty, and it features the same encryption capabilities to keep important data protected. Enjoy reading up on portable tech? Why not check out our round up of the best portable speakers.